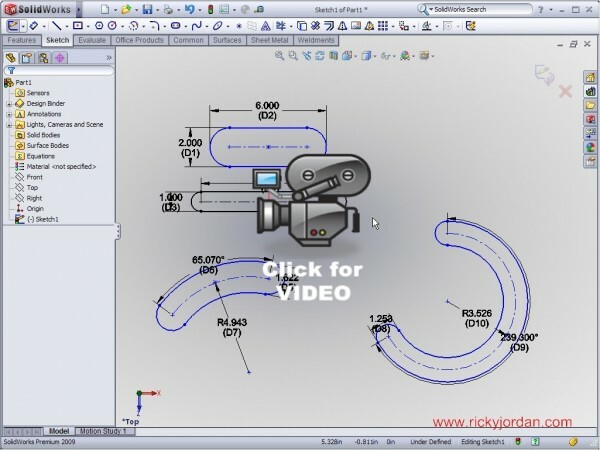 New in SolidWorks 2009 is the Sketch Slot feature. This sketch entity allows you to quickly create both Straight Slots and Arc Slots in a variety of creation methods. When you use this type of sketch entity and an Extrude Boss or Cut is created from it, a temporary axis is created not only at the arc center points, but also at the center point of the slot. The PropertyManager for the Slot sketch entity is shown below. Click on the image below to see a quick video demonstration on the various methods available to create a Sketch Slot. Ricky, what a great tool this will become. I'm looking forward to it. Ricky, what a great tool this will become. I’m looking forward to it. Thanks Steve! I agree. This will be a nice tool to have! Previously ( in the sw beta ), “add dimension” also work for rectangular, circle….Today when I try in PR1, I cant find the add demension. Make sure that the option for “Enable onscreen numeric input on entity creation” is checked. After enabling this and enabling the “Add dimension” option in the PropertyManager for circles & rectangles, you should see your dimensions appear automatically.